Shaune Peebles is a Canadian English teacher (and world traveller), with over 10 years’ experience across Asia and Europe. 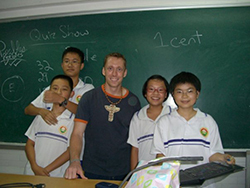 Shaune discovered his teaching vocation in Guangzhou, where he worked for more than two years at Guangdong University of Foreign Studies (GDUFS) and at the Wall Street Institute (among others), before moving to Italy with his wife in 2009. He currently lives in Treviglio, near Milan and is still passionate and devoted to his profession. As I’m sure it is with most people, the long story is a rather long story. In essence, I chose to move to China because, at the time (2004), I wasn’t really doing anything beneficial to my future career growth. An old co-worker (and later girlfriend) who had already moved to Guangzhou invited me to apply for a position in the business English department at Guangdong University of Foreign Studies (GDUFS). My initial idea of teaching in China for six months quickly turned into a year, and then another two years following that. The idea of moving to Asia to learn a new language, experience a new culture and of course to travel was very appealing to me. From a logistical perspective, I needed to make a trip to Calgary from Edmonton in order to get my tourist visa (GDUFS looked after my work visa after I arrived), as well as a comprehensive round of immunisations (hepatitis, Japanese Encephalitis, Typhoid/Diphtheria, and TB) and a full medical check. Aside from that, it was the usual process of tickets/passport/money. I was fortunate to have a friend who was already well-established in the areas around the main/southern campuses. Without that network, the first period would have been much more difficult. During the first weeks, everything is very exciting and new. I was able to make some new friends very quickly, and always had a relatively easy time getting along with my students and co-workers. Initially only English teaching at the university – oral English and business writing for the Business English Department. After a short period, I began to take voice recording jobs and took extra work through the university. I helped to edit articles for the English version of their website. I also had a couple of experiences with TV (a commercial and a news program) as well as hosting different dinner events as a “foreign guest”. 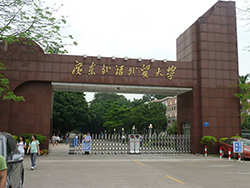 How did you find the Higher Education sector in China? I worked with both higher education and the private sector (Wall Street English in particular) during my stay in Guangzhou. GDUFS provided all the necessary services and assistance in terms of visa/permit as well as quite reasonable accommodation during my two-plus years under contract with them. 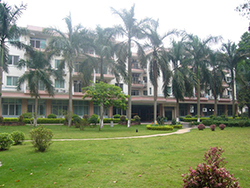 The teaching buildings were adequate – each room had a computer and Internet connection. The staff at the international office were exceptional and extremely careful in looking after the 80-plus foreign trainers. In addition, my departmental colleagues were always available to help with various teaching requirements; photocopies, translations when necessary, or general assistance moving around campus. The medical services on both campuses were satisfactory and, when needed, (on two separate occasions) the university provided a student to help with interpretation between clinic doctors/staff. I did not need to carry out any kind of research, publishing, or funding activities, although I was asked on occasion to help edit the research papers of my colleagues in the business department. What about your work with the students? Teaching activities consisted of approximately 14 hours per week of teaching, primarily at the south campus, for first and second year students. Extra work doing voice recording, teaching summer camps for three weeks in July/Aug, and also with the international school (for police officers) were almost exclusively oral/conversational oriented. I was also permitted to work off-campus for a key middle school (Guang Ya) for eight hours per week, and could, within reason, accept any extra work, provided it did not interfere with my GDUFS activities. I assisted in various campus activities; English Corner, English movie night and English speaking/singing competitions. As a new teacher, my students were very kind and patient with me and, as most Chinese students are, were very eager to practice with me whenever/wherever possible. They were genuinely curious to learn more about Canada and my personal life, but at the same time were great teachers for my own Mandarin speaking. I found that teaching larger groups was only really possible if I broke them in to smaller teams and structured my lessons to include some kind of role-play or presentation. Living on campus near (or with) other foreign teachers made the social aspect very comfortable. During my stay at the south campus, a group of us (four to five teachers) organised some evening lessons for students from the Chinese as a Second Language department. This took place two or three times a week and was paid for by us. During the day/week various teachers from the main campus would come out for their lessons, so there was always a lot of opportunity to meet with other foreign teachers for lunch. The university was great for organising a variety of teacher activities and excursions – a weekend in Zhuhai comes to mind, as well as a week-long trip to Sichuan the first summer I was in China. 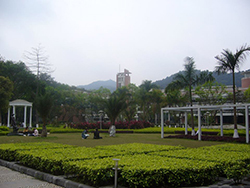 While the south campus (also known as university city) did not have as many options, it was easy to reach the centre of Guangzhou by bus/taxi. With the growing number of expats at the many bars and restaurants, there was certainly no shortage of activities. From the cultural perspective, there were a number of regular music events that I attended (concerts/DJs) with a group of foreigners who were outside of the GDUFS teaching circle, which added to my network. For me, the best moment (aside from meeting my wife) was winning the ‘Model International Teacher’ Award in 2005 and 2007. As I mentioned, I was an absolutely “new” teacher with zero experience in English as a Second Language teaching and zero international experience in general. I worked hard during the first term just to be able to prepare a proper lesson and be able to answer my students’ questions without feeling too embarrassed. I was always a good “people person” thanks to my time in restaurants/bars in Canada, but teaching was a very difficult environment for me. To be recognised by the students, my peers and the university was a huge honour, and one that led me to continue in the field of teaching with GDUFS and Wall Street, and now as a corporate trainer in Milan. Being a foreigner in China comes with good days and bad. The difficulties learning Chinese or understanding what’s happening or being said began to wear on me after a few years. That, and the constant motion and activity of a city of 14 million people made it very challenging just to leave the house some days. The pollution is something that, while you can usually get used to in the short-term, is quite honestly a factor in any future decision to return. How has working overseas helped your career (helped you professionally and/or personally)? One of the first topics that I discuss when I interview for a new position, or meet a new group/manager in Milan is my time in China. It’s difficult to quantify, but just the reaction and the subtle change in body language seems to raise my credibility in the eyes of the students or the company I’m meeting with. Learning Chinese opened my mind to learning Italian; having the opportunity to travel opened me to new experiences and friendships; meeting my wife, while maybe not directly helping my career, has opened doors to an extended experience in Italy, which for Canadians is not always the easiest country to work in due to visa/immigration factors. Had I not moved to China, I’m sure my life would be extremely different to what it is now, and while I wouldn’t immediately accept an offer to return, it’s made me a better professional and quite frankly a better person. It’s certainly affected my family – both of my brothers visited while in China, as well as my parents – and all of them have increased their own travel experiences significantly since I moved abroad ten years ago. Don’t take yourself too seriously – you’ll look, sound and feel like an alien throughout your stay in China. People will stare at you and want to touch your hair and be photographed with you; just go with it. Allow yourself to be homesick – it’s natural, and it goes away. Find a good movie, a book or a pub, and don’t be afraid to spend a weekend involved in it. If you’re planning to stay for a long time: once a month, leave the city; once every three months, leave the country; once a year, leave the continent or go home for a visit. This advice was given to me on a recent trip to Shanghai by an expat who had been there for five years. I wish I had heard it while I was there because it makes a lot of sense to me. China can be wonderful, but for someone from a small town in northern Canada, it can also be extremely overwhelming. Leaving Guangzhou more frequently would have been great for my sanity – not just day-trips to Hong Kong to do some shopping, or weekend trips to get a new visa. There’s a lot to see, and there are always a lot of other foreigners who are, or could be, willing to escape for while too. Giulia Falato is a Chinese language teacher and PhD student at the University of Rome “La Sapienza”. She first visited China in 2004 as an exchange student in Shanghai where foreign students were uncommon and scholarships even rarer. Her past experience includes, but is not limited to: a three-month internship in Guangzhou and participation in the international Chinese language competition for university students; the “Chinese Bridge”, or Hanyu Qiao. From 2009 to 2013 she lived and worked in Beijing as the Lecturer of Italian Language at Peking University — the Chinese equivalent of Oxford or Cambridge.